Keep Australia Beautiful has released the 2015-16 National Litter Index (NLI) data results. 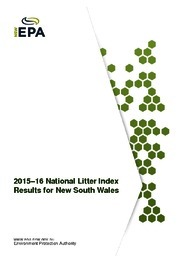 The EPA report shows both the New South Wales and National litter results based on this data. The report provides important information for New South Wales to understand litter across the state and develop programs and policies to tackle the problem. Importantly, this information is used to track progress towards achieving the Premier's Priority to reduce the volume of litter in NSW by 40% by 2020. Key results for 2015-16 show a 12% reduction in litter volume and a 4% reduction in litter items in NSW. Illegal dumping is diposing of waste, usually bags of household rubbish, old furniture, tyres, garden waste or other general household items, on road sides, paddocks, vacant blocks instead of a designated landfill site. A mixed-use development is made up of retail, food and residential components, both high- and low-rise. Waste management systems are differentiated between the low-rise, high-rise and commercial elements of the development. Importantly, waste from the commercial sector remains segregated from the domestic waste at all times. This complex shows different elements of waste management for this type of complex. Sutherland Shire Council works with developers to identify waste requirements and provide flexible services where possible, particularly for large-scale developments that generate high quantities of garbage and recycling. This mixed-use development is located in a popular tourist area. The development consists of nine storeys of residential accommodation above three levels of cafes and restaurants and a low-rise residential complex located along the front of the development above commercial premises. It represents various elements of waste management practices. This large-scale multi-unit dwelling development has 60 low-rise villas of two storeys and garage. The site has dual frontage that assists collection, and a number of waste storage areas located in each block of units for effective service provision. Each communal storage area is conveniently located for residential access and allows easy transfer of bins to the kerbside collection point. The storage areas have been designed to accommodate garbage and recycling bins and blend aesthetically with the style of development. This smaller multi-unit development consists of 16 two-storey townhouses and is divided into two blocks of eight dwellings. Each block has a communal waste storage area for shared residual and recycling bins. Residents are responsible for taking their waste and recycling to the communal storage areas while a caretaker keeps the communal storage area clean and tidy and moves the bins to and from the kerbside collection point. This large-scale multi-unit dwelling consists of a series of three-storey (low-rise) unit blocks. The development is an example of the use of one large communal waste storage area to serve all dwellings in the complex, as well as the waste maintenance system. Space has been allocated within the storage area for the interim disposal of bulky items. A garden organics service is also provided, and with the large number of bins for the complex, clear separation of each waste stream is necessary to minimise contamination. Fairfield City Council services a large number of three-storey walkup developments. The council is currently trialling the use of an underground bin for garbage collection in one of these developments, as a possible replacement for their existing bulk and 240L bin waste systems. The trial period will examine the potential benefits in terms of odour control, amenity and increased efficiency servicing. Integrated developments can provide residents with access to a variety of services and different accommodation options within the one site. They contain a series of different building types and uses. Collection of garbage and recyclables from these developments can be problematic if not well planned and managed, due to private roads within the development, shareways between buildings and the generation of commercial and domestic waste. This example shows a high-rise complex that consists of two connected development blocks. Originally designed and built as a hotel, the development now incorporates residential accommodation. Each block of units has a waste management system integrated within the new design. There is an on-site building manager who controls and monitors the waste system during the week and an appointed person on the weekend. This development consists of a series of separate three- and four-storey multi-unit developments. Collection of bins from locked gate communities can be problematic due to such issues as access and the different development types. This case study is an example of better practice where waste collection has been planned and developed in conjunction with the council to minimise collection problems. Residents can easily access facilities within the site such as basement storage areas and a caretaker is responsible for taking bins to and from designated collection points. The Waste Avoidance and Resource Recovery Strategy Progress Report summarises progress towards meeting the targets in the NSW Waste Avoidance and Resource Recovery (WaRR) Strategy (2007) and makes comparisons to previous progress reports using the same methodology. 10.4 million tonnes of material were diverted from landfill. Despite economic growth, total waste created per capita fell. By maintaining overall waste generation at the 2008–09 level, the target established in the 2007 WARR Strategy was achieved. At 62.8%, the recycling rate has increased by 0.9% from the 2012-13 rate, and 18% from the 2002–03 rate. Despite this significant progress, the ambitious 2014 recycling targets were not met. Recycling rates were 58.2% for MSW (target of 66%), 58.1% for C&I (target of 63%) and 70.7% for C&D (target of 76%). View annual reports detailing local government kerbside collection performance and waste data surveys. This research provides a benchmark for monitoring changes in knowledge, attitudes and behaviours relating to household waste management and recycling. The research was conducted with a representative sample of the NSW population and the results include recommendations on future strategies for programs looking to influence kerbside recycling, organics, problem wastes and illegal dumping. This piece of research will also assist in evaluating the effectiveness of these programs via tracking studies.